Lucuma has been cultivated in the Peruvian highlands since 200 AD when the ancient Moche people first acquired a taste for this unique caramelly-sweet fruit. It had both nutritious and symbolic value, being a staple food source as well as a common religious offering associated with fertility. Images of lucuma appear on ceramics found at archaeological sites, and it was once known as “the gold of the Incas”. The sweet tasting fruit is popular today across central and southern America and is grown in Peru, Ecuador, Chile and parts of Bolivia. Lucuma is added to ice cream, pies, cakes, cookies and other sweet deserts and imparts an exotic, syrupy flavour which complements sweet desserts. In Peru lucuma is the most widely eaten ice cream flavour, more popular than chocolate. This fruit is so well loved by Peruvians there are a total of 26 villages named after it — 20 called ‘Lucma’ and 6 called ‘Lucuma’. 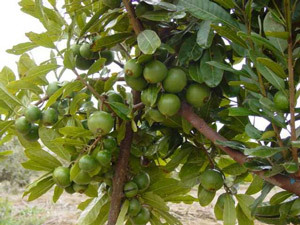 The lucuma tree grows best at altitudes between 4,500 and 10,000 feet; although drought resistant, it is sensitive to frost and doesn’t grow well closer to sea level, and needs high levels of humidity to produce an optimal yield of fruit. 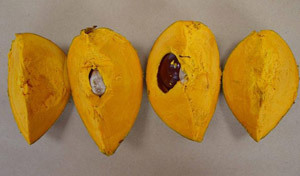 Lucuma trees begin bearing fruits after 5 years, and each tree is capable of producing up to 500 fruits over a year, and the large yellowy-brown cone-shaped fruit may be up to 10cm long and weigh a kilogramme. Our lucuma is grown on orchards in Peru. The evergreen trees grow up to 15 metres in height and have a straight, cylindrical trunk and shiny oval leaves. Greenish-yellow flowers are produced throughout the year, and after being pollinated fruits will mature on the tree for around 9 months. 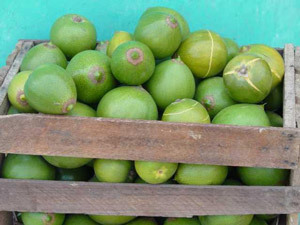 The lucuma tree bears fruit throughout the year, but the main harvest occurs in the spring between January and April. Powdered lucuma can be added to a variety of foods to enhance both flavour and texture. The natural sweetness of this product means it can be substituted for sugar and as lucuma powder is low GI (the glycaemic index of a carbohydrate’s effect on blood sugar levels) it releases energy slowly without causing a rapid increase in blood sugar levels. Lucuma is an entirely natural sweetener/alternative to refined sugar, and is ideal for those aiming to lose weight through a low calorie diet. Evidence suggests it may help slow the release of sugar into the bloodstream by inhibiting the enzymes which break down starch into glucose. Unlike sugar which is devoid of any nutritional value, lucuma is also a good source of iron, which is needed to produce healthy new red blood cells to carry oxygen around the body, and the vitamins carotene and niacin. Our lucuma powder can be included in any dessert recipe and will add a buttery, sweet taste to cakes, biscuits and pies, without the need for any extra sugar. The caramel coloured powder is versatile and easy to use; just mix it in with any food that would benefit from the maple rich natural fruit flavour, and increase the vitamin content at the same time.